Although the use of heavy metal armour during the Middle Ages made swordsmanship virtually obsolete, the development of firearms in the 15th century then made armour obsolete. As the weapon of last resort, close­ quarters combat and the means for settling disputes among gentlemen, skill with the sword resumed its importance. The swords of that period remained long and heavy, cutting with the sharpened edge. Tactics included wrestling holds and moves to disarm or immobilise the opponent for the killing blow. Fencing based on speed and skill began with the longer, lighter rapier, developed in Italy during the 16th century. Fighting at distance using quick, controlled lunges, attacking with the point of the sword, replaced the hack­ and­ slash of earlier weapons. Under Louis XIV in France, fashionable French courtiers began wearing a shorter ‘court sword’. Both lighter and stronger than the rapier, it worked well for defence as well as offence. The recognisably modern fencing technique developed with this weapon. A special version of the court sword, the foil, was developed for practice. Another type of sword, the colichemarde, was created for duelling. The blade had a triangular, slightly concave cross­-section, which reduced weight without reducing strength. The colichemarde evolved into the modern epée. The third of the fencing weapons, the sabre, was introduced into Europe in the late 18th century as an adaptation of the Turkish scimitar, adopted by the Hungarian cavalry. It was so effective that most armies began using it. The sabre was originally a very heavy, curved sword, but a lighter, more easily wielded weapon with only a slight bend was developed in Italy late in the 19th century for duelling and fencing. 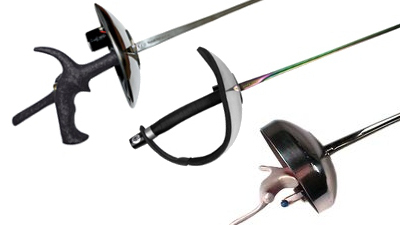 Modern fencing weapons – foil, sabre, epee. Historically, the foil was used as a practice weapon for heavier duelling weapons. The weapon itself is light with a very flexible blade (square in cross­-section) and having a small bell­ guard. Foil is a very technical weapon and scoring points is governed by the concept of “right of way” or a fencer’s priority of attack. Epée is the closest modern relative to the actual duelling sword. It is heavier and less flexible than the foil and has a larger bell­ guard. In cross­-section, an epée blade is triangular. There is no “right of way” with epée fencing, the first touch scores the hit and the entire body is target. The modern fencing sabre is straight, like the foil and epée, but treats the front edge as a cutting surface which can be used to make hits on an opponent. The sabre resembles the cavalry sword, having a light, flexible blade and a ­guard that curves round to protect the fingers. Sabre blades are more rectangular in cross­ section than the foil blades and they have a flattened section near the tip. Hits can be scored with the edge or the point and are scored on any part of the body above the waist. Like foil, sabre fencing depends on a fencer’s right of attack in order to score points. The fascinating aspect of the modern sports weapons is how the rules and techniques for each appeal to different kinds of fencers; dynamo, duellist or buccaneer – which is your weapon?